Julie Moss and her husband. Catholic schools are supporting the troops, as well as the family members they leave behind in order to serve their country. Julie Moss, a 7th grade U.S. history and 12th grade economics and government teacher at Bishop Grimes Prep also is an alumnus of the class of 2000. She said the school has been helping those in the military since the Gulf War. But last year when Moss learned her husband would be deployed to Afghanistan through the Air National Guard, she spoke with Bishop Grimes’ spiritual life director, Josie Rabideau, and the school’s student council moderator, Patrick Kinne, to see if more could be done. 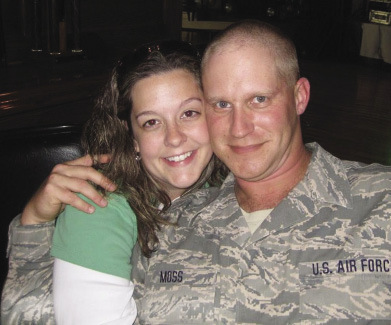 They developed a project called “Serving Those Who Serve,” in which goods are collected to be sent to local troops who are deployed with Moss’s husband in Afghanistan. The school also has a Yellow Ribbon Club, which puts together care packages each month. Francine Camino, a 5th grade teacher at St. Margaret’s School in Mattydale, said her school “adopted” her son Nicholas and the men and women serving in his squadron while he was in Iraq. Her son is a loadmaster on a C-130. He has been deployed three times since enlisting four years ago. In return, Nicholas flew the St. Margaret’s flag in Iraq and Kuwait. When he came home, he presented this flag to the principal and visited classrooms to answer questions and show the children some slides. “They were just in awe because he came in his loadmaster’s uniform, and they asked him all kinds of questions, ‘What do you eat? How long do you fly? What’s your job like?’ stuff like that,” Camino said. Nicholas has told his mother how much the letters and boxes meant to the people he served with in the Middle East. The outpouring of support has meant a lot to Camino, too.